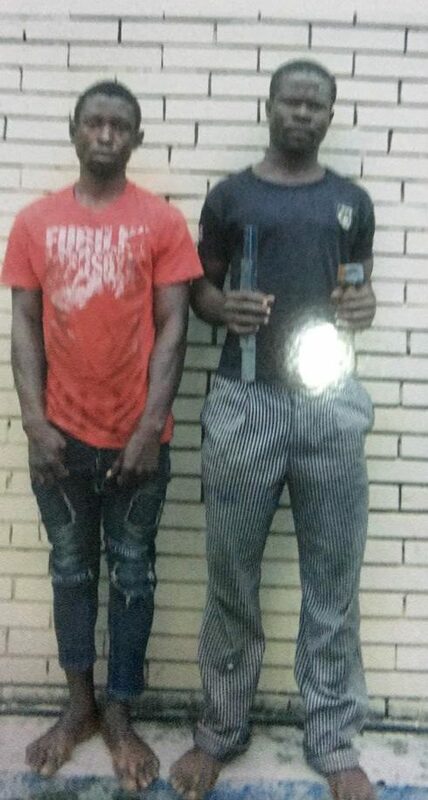 Home » » Two Notorious Traffic Robbers Arrested In Lekki. Two Notorious Traffic Robbers Arrested In Lekki. Two notorious armed robbers who specialised in robbing commuters along Lekki/Epe expressway have finally been arrested by the police in Lagos. The suspects Akpan Samuel and Ani Chukwuma, were remanded in Ikoyi prison after their arraignment at Igbosere Magistrates Court on Thursday, November 1, 2018. This was disclosed by the Police Public Relations Officer, PPRO, CSP Chike Oti, on behalf of the Lagos State Commissioner of Police, Mr. Imohimi Edgal. He said that the robbers who were nabbed on 29th October, 2018, by operatives of the Command led by the Divisional Police Officer, Maroko Division, CSP Isah Abdulmajid, revealed during interrogation that their modus operandi was to mount the pedestrian bridge at Maruwa bus stop, Lekki/Epe expressway. At that vantage position, they were able to monitor the traffic and carefully selected their target. They will thereafter swoop on the targets and rob them of their valuables by using a big hammer to smash the side glasses and windscreens of drivers who refused to roll down their glasses when commanded to do so. The hammer and an improvised pistol that appeared like a perfect prototype of a berretta pistol were recovered from them. Their activities had been a source of concern to the Command thus the Lagos CP directed the DPO to mobilise everything at his disposal to ensure the arrest and prosecution of the hoodlums. CP Edgal assured that the activities of this set of criminals will soon be a thing of the past as the Command has increased surveillance along all routes with heavy traffic.